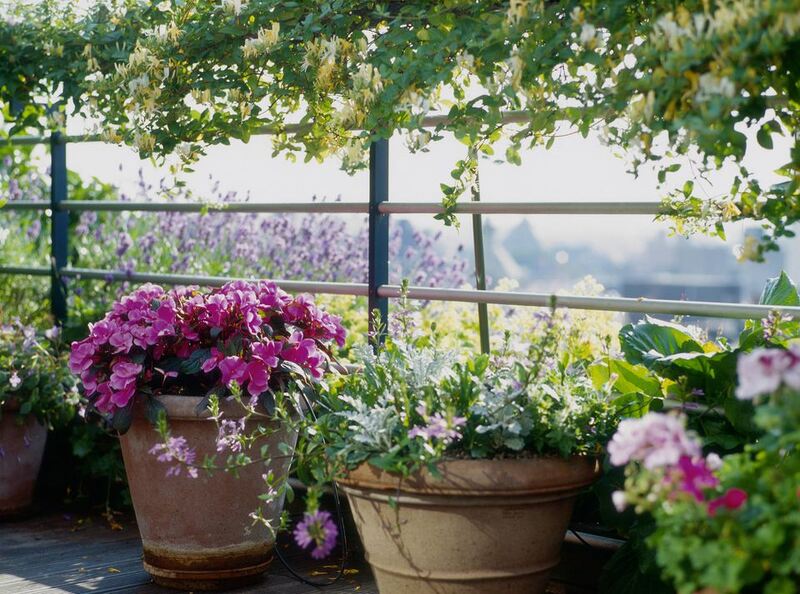 What is more cheerful in your outdoor space than pots of planted flowers? Not many types of decor are easier to make happen, either. And even if you're not new to container gardening, everyone can enjoy learning a new trick or two. Avoid the 10 most common container gardening mistakes. Ever tried to lift a large garden container filled with dirt and plants? It can be overwhelmingly heavy. When using a large or unwieldy container, place your pot where it will live and then fill it–you’ll save your back! Also, if you know you are planting shallow-rooted plants in a very large container, fill the bottom third with empty plastic bottles, and then place plastic screening over them. You can also use a product called ​"Better Than Rocks" to take up space. Fillers make your container lighter (and less expensive) because you don't need as much potting soil. Pot stands with wheels can also come in incredibly handy if you end up having to move a heavy pot into partial shade during the hottest part of summer. All the plants in one container should share the same sun, soil, and water requirements. Find out this information from your seed packets or plant labels and plan the containers accordingly. Most potting mix has very few of the nutrients that plants require to be healthy, and they're either used up quickly by the plants or are washed out with repeated watering. So you will need to add food to the soil. There are many fertilizer products on the market; just remember to choose what you need based on the plant type. Flowering plants have different nutrient needs than vegetables and herbs. Fertilizing container gardens regularly is key. You can start with a slow-release fertilizer mixed in with your potting soil when you put the plants into the pots, and then add a diluted, liquid fertilizer, such as fish emulsion, every couple of weeks. Organic or all-natural fertilizers will improve the soil as they break down and don't run the risk of building up chemicals or salts. To avoid overwatering your container gardens, use containers that have drainage holes–lots of them. Also, be aware of the moisture requirements for your plants and then follow them. Before you water, check if your soil is moist. To do this, put your finger into the soil up to your second knuckle. If the soil at your fingertip feels dry, water the plant. If you do overwater, the leaves may turn yellow and fall off, or your plants may get limp. If your soil is too wet, move the container to a dry, breezy spot until it dries out. If you have the room, you can also move your container garden into a garage or sheltered spot to dry it out, particularly if the weather continues to be wet. Most container gardens need watering at least once a day in the heat of the summer. Many, especially hanging planters or small containers, need watering even more often because there is less soil to hold moisture. When you water, really soak your plants–if you give them just a sip, only the top layer of soil will get wet. Water until you see it coming out of the bottom of the pot. Many people use water crystals in the soil that absorb water and then slowly release it when the soil dries out, but they are expensive. More than one study has shown that they aren't effective, so skip buying those. If your plants do dry out completely, don’t despair; even the most pathetic, limp plant might revive with a good drink. If the container is small enough, submerge the whole thing in a bucket of water until the air bubbles subside. For a large container, take a skewer or stick and gently poke holes deep into the soil to allow water to reach the plant roots. Then, water generously. Consider the proportions of your plants to their container. A large container stuffed with short plants can look stunted. If you need a rule of (green) thumb, try to have at least one plant that is as tall as the container. Also, plants that spill over the sides soften the edges and add texture and interest. Don't put too much in one pot; remember, the plants will grow bigger as the season goes on. Plants crowded in smaller pots grow more slowly than those that have room to stretch out. Buying plants at a reputable local nursery is a good place to start in your quest for healthy plants. You have a greater chance of getting plants that are disease and pest free and well cared for at a nursery that starts its own plants than at a big box store that buys from distributors. At a nursery, you can also get a wealth of information and advice from knowledgeable staff. Don't be afraid to ask someone to help you pick out a good plant. Make notes as to which plants came from where; if you end up buying a tomato plant with blight from a big box store, you can pull it and the others that came from that store, hopefully before the disease seriously affects others in the garden. After you’ve tried everything a plant still looks dreadful, cut your losses and toss it on the compost pile or in the trash. If only one plant in a container garden doesn't make it, just pull out that plant and replace it for an instant visual improvement in the container garden. Before you plant your containers, evaluate your time available for their care. Do you travel a lot during the summer? If so, either use self-watering containers or an automatic drip irrigation system, enlist some help to keep your plants healthy and alive while you’re gone, or purchase plants that don't need a lot of water. Garden how you live. Are you casual or formal? Some people like neat, well-planned, formal containers. Others enjoy plants that spill and sprawl over the edges as they like, planted in a multitude of colors rather than in a particular design scheme. However your container garden ends up, it's really a low-risk outdoor decor technique—there’s a lot of room for error. Pick plants that grab your eye, and experiment with combinations and placement. Whatever your lifestyle or personality, you can plant containers that will give you joy and bring beauty to your surroundings.